Section 199A deduction also known as the Qualified Business Income deduction arises from the Tax Cuts & Jobs Act of 2017. This is a significant tax break for small business owners but there are rules and limits of course. Section 199, without the A, is the section covering Domestic Production Activities Deduction. Section 199A is seemingly modeled after this (or at least a portion was ripped off by legislators) since the mathematics and reporting is similar between Section 199A and Section 199. Recall that Domestic Production Activities Deduction was reported on Form 8903 and eventually deducted on line 35 of Form 1040 (rumor is it’s now dead). However, it appears that Section 199A Qualified Business Income deduction is a deduction from adjusted gross income to arrive at taxable income (what we nerds call a below-the-line deduction, from AGI). This is contrasted with an adjustment to gross income to arrive at adjusted gross income (what we nerds call an above-the-line deduction, for AGI). It is unclear how Form 1040 will be modified to accommodate this new deduction- personal exemptions no longer exist so there is room to replace one deduction with another. We’d all despise seeing Form 1040 move to three pages. Yuck. “The line” is essentially lines 37 and 38 of the Form 1040 which represent adjusted gross income (AGI). Sole proprietorships (no entity, Schedule C). Real estate investors (no entity, Schedule E). Disregarded entities (single member LLCs). Any entity taxed as an S corporation. Trusts and estates, REITs and qualified cooperatives. Performing artists who perform on stage or in a studio. Anyone who works in the financial services or brokerage industry. Interestingly, removed from the traditional service profession are engineers and architects. But an engineer operating a business based on his or her reputation or skill is still a specified service trade. Sit on the ledge, sure, but don’t jump off a bridge just yet. The specified service trade or business problem only comes up when your taxable income exceeds the limits. So, a financial advisor making $150,000 might still enjoy the Section 199A deduction. Keep reading! Based on taxable income including all sources (not just business income). Also limited to 20% of taxable income. See Line 43 of 2017’s Form 1040 to assess your 2018 taxable income using 2017 as a proxy, adjusted for itemized deductions and exemptions (or lack thereof). Single is $157,500 completely phased out by $207,500 (adjusted for inflation). The $157,500 should mean something else to you- it is the end of the 24% marginal tax bracket. Married filing jointly is $315,000 completely phased out by $415,000 (adjusted for inflation). Same thing here- $315,000 is the end of the 24% marginal tax bracket. (ii) the sum of 25 percent of the W-2 wages with respect to the qualified trade or business, plus 2.5 percent of the unadjusted basis immediately after acquisition of all qualified property (in other words, prior to any depreciation). Wilma makes $100,000 in net business income from her sole proprietorship but also deducts $5,000 for self-employed health insurance, $7,065 for self-employment taxes and $10,000 for a SEP IRA. These are not business deductions- they are adjustments on Form 1040 to calculate adjusted gross income. Her deduction is the lessor of 20% of $100,000 (net business income) or 20% of her taxable income, which could be less (see Pebbles below). This might change as the IRS clarifies. Barney owns three rentals with net incomes of $20,000 and $5,000, with one losing $8,000 annually. These are aggregated to be $17,000. He would deduct 20% of $17,000. Barney has passive losses that carried forward and are “released” because he now has net rental income, those passive losses are taken first. With using the same example above with $10,000 in passive loss carried forward, Barney’s deduction would equal $17,000 less $10,000 or 20% of $7,000. Pebbles earns $100,000 but reports $80,000 of taxable income on her tax return due to other deductions such as her itemized deductions. Her Section 199A deduction would be $16,000 since it limited by the lessor of 20 % of $100,000 or $80,000. Mr. Slate operates an online retailer S corporation which pays $100,000 in W-2 wages and earns $400,000 in net qualified business income. Because he is considered a “high earner” by exceeding the income limits, his deduction is limited to 50% of the W-2 or $50,000 which is less than 20% of $400,000. If Mr. Slate instead operates as a sole proprietor and earns $500,000 but does not pay any W-2 wages, his deduction is the lessor of 50% of the W-2 wages (or $0 in this example) or 20% of the $500,000. If he paid out $200,000 in wages and had $300,000 in net business income, his Section 199A deduction would be the lessor of 50% of $200,000 or 20% of $300,000. In other words, he would deduct $60,000 ($60,000 is less than $100,000, even in Canada). He would want to create an LLC, tax it as an S corporation and pay out W-2 wages to maximize his Section 199A deduction. If Mr. Slate instead operates as a specified service trade as defined previously, he would completely phase out of the Section 199A deduction by exceeding the income limit of $207,500 and $415,000. This is the specified service trade “gotchya.” But remember, this is no different than the 2017 tax law. If Mr. Slate was married and operated a specified service trade, and the taxable income considering all income sources (spouse, investments, etc.) exceeded $315,000 but was less than $415,000, there would be a sliding scale of deduction eligibility. Silly rabbit, tax reform doesn’t mean tax simplification. Fred… yes, we can’t neglect Fred… is single and operates an S Corp as an accountant. Days of busting up rocks for Mr. Slate are in the rear-view mirror. He earns $100,000 in net qualified business income after paying $50,000 in W-2 wages to himself. He is a clearly a specified service trade but because he earns less than $157,500 total ($150,000 in this example) he can take advantage of the full Section 199A deduction of 20% of $100,000. The question of reasonable salary is not being entertained here… focus on the W-2 to income relationship. 20% x $500,000 is $100,000 (straight calculation). 50% of $0 is $0 (W-2 limit calculation). 2.5% of $1,000,000 is $25,000 (depreciable asset limit calculation). Section 199A is limited to the lessor of $100,000 as compared to the greater of $0 (W-2) and $25,000 (depreciable assets). There are examples with spreadsheets and other explanations at the end of this webpage. Warning- it is dry material and uses spreadsheets which makes it worse. No entity is penalized under the new tax law. Some entities and situations might not qualify or be limited in some fashion, but the high-water mark in terms of taxation is the old 2017 tax law. Taxable income becomes a big deal for two reasons! First, $1 over $157,500 or $315,000 starts the specified service business disqualification and W-2 limitation (and there is also a depreciation component that we are glossing over in this summary). Second, the Section 199A deduction is limited by 20% of taxable income from all sources (what would be reported on your tax returns). W-2 wages include all W-2 wages, not just those paid to the owner(s). Converting a 1099 contractor to a W-2 employee might be beneficial. Rental income remains unclear as well from a W-2 perspective. If a rental property owner earns $500,000 net income after expenses, his or her Section 199A deduction is $0. As such does the rental property owner need to issue a W-2 similar to an S corporation just to grab some Section 199A deduction? Issuing W-2s in sole proprietor, single member LLC and partnership environment is not explicitly disallowed by the IRS but is not recommended by the IRS nor tax professionals. We will see how this turns out. It appears that self-employment taxes will still be calculated on the net business income BEFORE the Section 199A deduction since the deduction is taken “below the line” on Form 1040. So you could earn $100,000 and deduct $20,000 under Section 199A, but still pay self-employment taxes on $100,000. This remains unclear however and we will await further IRS guidance. S corporations remain a critical tax saving tool for two reasons. First, the usual self-employment tax savings remains intact for all business owners including specified service trades or businesses. Second, a business owner might need to pay W-2 wages to himself or herself to not be limited by income, and only corporations can pay W-2 wages to owners (in other words, an LLC cannot without an S Corp election). As you can see, there is some optimization that is necessary for a small business owner to get the most from the Section 199A deduction. On one hand we want to reduce W-2 salaries to shareholders to minimize self-employment taxes. On the other hand, we want to increase W-2 salaries so they do not limit the amount of Section 199A that is deducted. Remember that taxable income is all income for the household. If taxable income is less than $157,500 / $315,000 then the 20% deduction is fully available. If taxable income is greater than $157,500 / $315,000 but less than $207,500 / $415,000 then a partial deduction is available. If taxable income is greater than $207,500 / $415,000 then you are hosed. If taxable income is greater than $157,500 / $315,000 but less than $207,500 / $415,000 then a partial deduction is available with the W-2 and depreciable asset limit calculations phase in. If taxable income is greater than $207,500 / $415,000 then the 20% deduction is compared to the full W-2 and depreciable asset limit calculations (see Betty above). Our book, Taxpayer’s Comprehensive Guide to LLCs and S Corps, has been updated to the 2018 Edition which includes Section 199A deductions and other revisions based on the Tax Cuts & Jobs Act of 2017. If you’ve purchased it prior to the updates, please send us an email and we will forward you the latest and greatest version. We are going to walk you through a handful of examples comparing non-S Corp scenarios such as sole proprietorships, single-member LLCs (disregarded entity) and other pass-through environments to those same situations being taxed as an S corporation. We will demonstrate the benefits of the Section 199A deduction, and how it plays into the “should I elect S Corp?” question. Aside from the usual suspects such as not earning more than $35,000 or operating in Tennessee or New York City, every scenario provides an additional benefit by electing S Corp status on top of the Section 199A deduction. There are four variables you need to assign values to, a definition to consider, one tax bracket to memorize and two phase-out numbers to understand. Taxable Income- You need to determine the amount the entire household reports as taxable income, not just the business income. See Line 43 of your Form 1040 from 2017 to gain perspective of where you are. Write down 20% of this number. W-2 and Depreciable Assets- You need to calculate the total amount of W-2 wages the business pays including staff. Write down 50% of this number. You need to calculate the unadjusted basis (the value immediately after purchase before depreciation) of any depreciable assets the business owns. Write down 2.5% of this number (this becomes important for real estate investors). Qualified Business Income- Take your net business income after expenses, and write down 20% of this number. Specified Service Trade or Business- Does your business survive on the reputation or skill of its owner(s)? Are you an accountant, actuary, attorney, consultant, financial advisor, medical doctor, paid athlete or performing artist? End of 24%- The 24% tax bracket ends at $157,500 for single taxpayers and $315,000 for married taxpayers. The next tax bracket leaps to 32%. The 24% to 32% jump is clearly intentional and draws a line in the sand between middle class and upper middle class in our opinion. The Section 199A benefit might erode after the 24% marginal tax bracket depending on your situation. Phase Out- The income phase out period is $50,000 for single and $100,000 for married. We explained the decision tree above, however we want to illustrate the iteration in a different way. The question becomes, “How do I figure out my Section 199A deduction?” Besides using expensive tax software and professional advice, you can consider this flowchart. If your taxable income is in the 24% marginal tax bracket or less, stop. You are done and can select the lower of 20% of your qualified business income or 20% of your taxable income. Non Specified Service Business- You must now consider the Section 199A deduction based on W-2 wages or depreciable assets, and use the most restrictive of all Section 199A calculations. If you are in the income phase-out range (or the deduction limitation phase-in range, however you want to view the nomenclature), there is a linear, sliding scale of limitation based on W-2 wages and depreciable assets. In other words, the deeper into the phase-out range you are, the limiting effect of W-2 / assets becomes stronger. No need to hurt ourselves with the calculus at this point. Specified Service Business- You must now reduce your Section 199A deduction on a linear, sliding scale that reaches $0 as you move along the phase-out range (which is $50,000 for single taxpayers and $100,000 for married taxpayers). W-2 wages or depreciable assets come into play, but in a different way (our Section 199A PDF has an example). Your Section 199A simply ends after $207,500 (single) and $415,000 (married). How does all this Section 199A work? Do you want a tax projection with the new tax laws? Let’s schedule a time to chat! The Watson CPA Group offers expert small business consultation in-person, by telephone or via Skype. We love to Skype- faces, inflections, all the good stuff for our long distance clients. Heck, even people in the same building seem to prefer a phone call or Skype. Our fee is $150 for 40 minutes. If we decide to press forward with an engagement, we will credit the $150 towards future services like Section 199A salary optimization. If you don’t need convincing and already want our services such as business tax return preparation or S Corporation subscription, and you simply have some housekeeping questions, we answer those at no charge. Charging a consult fee to tell you how great we are is not cool. Can the Watson CPA Group and its support staff help you? Can we work together as a collaborative partnership? Hopefully you are still with us and not in the fetal position sucking your thumb. To hammer these points home, the Section 199A small business deduction won’t help everyone and the S corporation still has some shine (although perhaps less in some situations) as an overall tax reduction mechanism. There are some things we are unsure about. One example is 401k or defined benefits contribution. This is typically an adjustment on Form 1040 separate from Schedule C. Will these amounts get filtered back into the Section 199A calculation when basing it on Schedule C net business income? Probably… since this would be a double dip. Same with self-employment taxes and health insurance We’ll have to wait and see on handling the C.
What happens if big shot surgeon owns a gaggle of rentals which throws off $100,000 in net business income? Assume that he or she is phased out of the Section 199A deduction based on the specified service trade of being a doctor. Can he or she still get the Section 199A deduction based on the rental income? We would like to think so, but we’ll have to wait and see. But wait! What if the surgeon owned the rental as a self-rental, leasing it back to his S corporation surgery center? Rules already exist for self-rentals where the rental income cannot offset otherwise non-deductible passive activity rental losses. Can a person take a Section 199A deduction net rental income that includes self-rental income? The short answer is, We don’t know. Compartmentalizing specified service income away from non-service (i.e., retail) income might be a great tax strategy but with unknown ramifications. It is difficult to consider that the intent was to have specified service income taint all other business income without some allocation. The spirit was to limit the specified service trades and businesses from double dipping on self-employment taxes and Section 199A benefits after a certain income threshold. However, if the spirit of the rule is dwarfed by interpretive silliness which we all know might happen at least in the short-term, then we might have to leverage a C Corp to keep service income (taint) away from the remainder of qualified business income. For example, the same big shot surgeon earns $200,000 as a surgeon but also earns $500,000 from rental activity. Do we have to put the $200,000 in a C corporation just to grab Section 199A benefit on the $500,000 (of course using the 2.5% depreciable asset limitation)? We will have to wait and see. The hot question since the passage of the Tax Cuts & Jobs Act of 2017 and Section 199A is, “Should I revoke S Corp status and go to C Corp?” The answer is No. As you can see, a C Corp does not make sense after you add in capital gains tax on the dividends. This in turn makes sense- the lawmakers didn’t set out to kill S corporations. They set out to give every business owner a tax break. Geez… half of Congress (535 doesn’t divide evenly, we get it) probably run S corporations on the side. As you can tell, this webpage has grown to a ridiculous size. If you want a PDF version of this, use the button below. 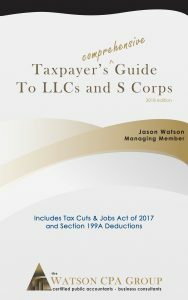 You might also want to check out our book, Taxpayer’s Comprehensive Guide to LLCs and S Corps, available on Amazon, iTunes and PDF. We just released the 2018 Edition which includes all this crud.